Morgan Stanley said the Wall Street and buy-side investors have already lowered their expectations for Apple’s December numbers after the guidance, so next week’s numbers will unlikely tank the stock further. All eyes will be on any forecast for the current quarter. 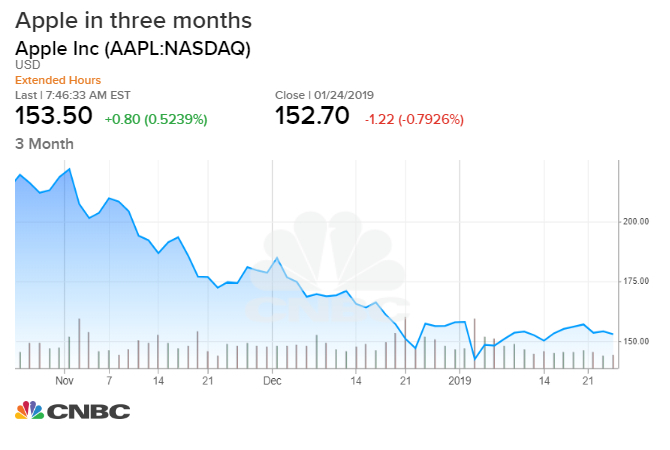 “March quarter guidance will provide a base for forecasts during the remainder of the year… Apple likely needs to deliver a better than feared revenue outlook for shares to recover further in the very near-term,” Huberty said. The bank rates Apple overweight and its 12-month price target of $211 will represent a 34 percent gain for the stock. Shares of Apple rose 2.8 percent to 157.05 in Friday’s trading. Morgan Stanley predicted Apple will have a gross margin of 38.4 percent and EPS of $2.65 in the first quarter of 2019. “Based on investor conversations, we believe the stock could trade up on revenue and gross margin guidance range of $58 billion and 38 percent at the mid-point, respectively, while guidance meaningfully below these levels would fuel the bear case,” Huberty said.